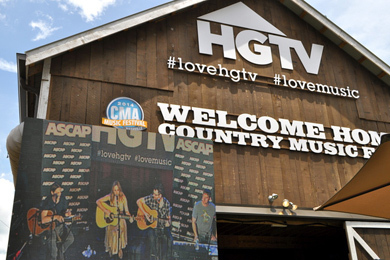 HGTV’s side stage for the 2015 CMA Music Festival will return to downtown Nashville with a newly expanded Lodge venue—a 3,500 sq. ft., air-conditioned, VIP lounge with 900 sq. ft. on the mezzanine that comes straight from the Super Bowl XLIX in Glendale, Ariz.
From June 11-14, artists (schedule below) will deliver performances on the hour. There will also be $4,000 in total cash giveaways during the week. DIY Network’s Alison Victoria, HGTV’s David Bromstad, and Great American Country’s Suzanne Alexander and Nan Kelley will co-host the live musical events.